Pedors Shoes is an orthopedic shoe company whose mission is to make Fantastically Functional Footwear. The Pedors brand was launched in 1997 with the introduction of the Pedors Black Classic and the Pedors Beige Classic. The Pedors company name originates from the word Pedorthics which is defined as the art and practice of designing, making, and fitting therapeutic shoes for relieving painful or disabling conditions of the feet. The company is known by the Pedorthists that have contributed to the design and success of the brand as The Pedorthic Shoe Company. The Pedors Classic line has become the industry standard for orthopedic stretch shoes and is recognized as the original orthopedic stretch shoe. Pedors continues to use the latest developments in material technology to continually improve product performance. Pedors Pedoprene ™ is a proprietary blend of EVA and Neoprene that not only stretches to accommodate a forefoot deformity but can also be heat molded if required. When considering a stretch shoe it's important to ask the following. a) Does the stretch material stretch at all? Surprisingly, some manufacturer's use materials that do not. Ordering a product that is supposed to stretch but doesn't, defeats the purpose of fitting the shoe in the first place. If you order a shoe and find that it doesn't stretch the way you want it to - send it back. b) Does the stretch material stretch too much? Some products use lycra or spandex like materials that stretch but provide little, if any, support. Usually these products have a rigid toe box that also defeats the object of the design. c) Can the stretch material be heat molded and modified to address a particular forefoot deformity? A shoe that can accommodate a spot heat mold ensures relief from potential trauma caused by a pressure point. Pedors products are fitted for a wide range of foot and ankle problems by allied foot care medical professionals covering a broad spectrum of care including Pedorthists, Podiatrists, Orthotists, Prosthetists, Orthopedists, Foot and Ankle Surgeons, Wound Care Specialists, Vascular Surgeons, Neurologists, Endocrinologists, Rheumatologists, Gerontologists, Pharmacists, Nurses, Physical Therapists, and other professional care givers that require footwear solutions for their patients. Pedors Shoes are fitted for a wide range of pathologies including arthritis, diabetes, peripheral vascular disease, peripheral arterial disease, peripheral neuropathy, lymphedema, epidermolysis bullosa, and conditions where accommodating footwear is required to manage the care of the foot. Pedors Shoes along with appropriate inserts or orthotics are fitted for various forefoot deformities including metatarsalgia, metarsal-cuniform exostosis, bunions, corns, callus, toe deformities, tailors bunion or bunionette, sesamoiditis, turf toe, hammertoes, claw toes, hallux valgus, plantar fasciitis, heel pain, flat feet, drop foot, swollen feet, Morton’s neuroma, Morton’s Syndrome and other forefoot issues. Pedors Shoes are designed to accommodate ankle braces and ankle foot orthoses or AFO’s to improve ankle stability and fall prevention. 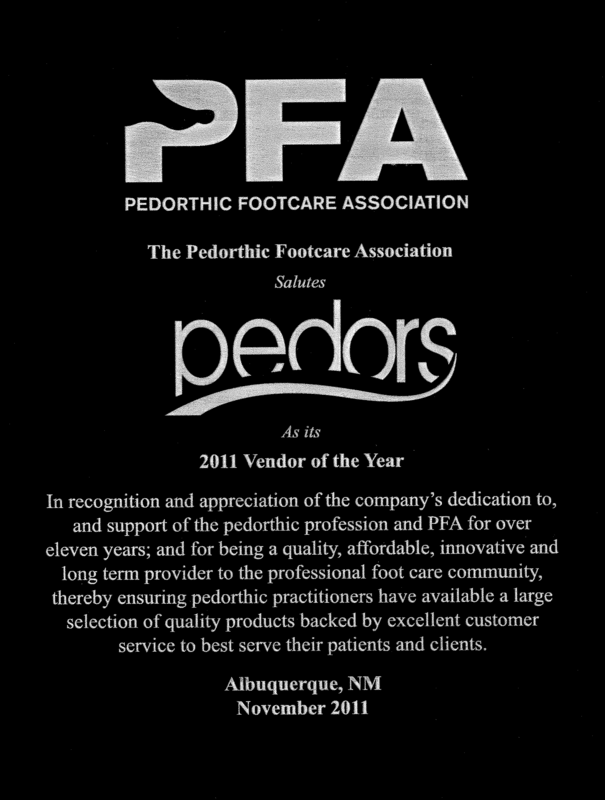 Pedors products are fitted by foot care professionals worldwide with distributors spanning the globe.